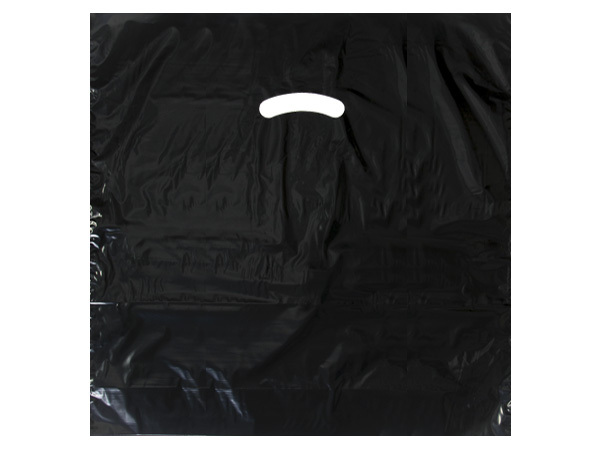 9 x 12" 12 x 15" 15 x 18 x 4" 20 x 20 x 5"
20 x 20" x (with 5" bottom gusset) Black Super Gloss Plastic Bags are made from 25% recycled plastic. Yes! We can print it! Personalize your bags with a company name and/or logo for great advertising. Call our Custom Print Department at (800) 547-9727 ext. 4 for details. Our best stock plastic bag yet! Super Gloss Plastic Bags are glossy, soft and have excellent color intensity. This low density blend offers greater handle strength and tear resistance compared to high density bags. Made in the USA in a top rated environmentally efficient facility from 25% Recycled materials. Flexible and strong made from deluxe low density polyethylene plastic.